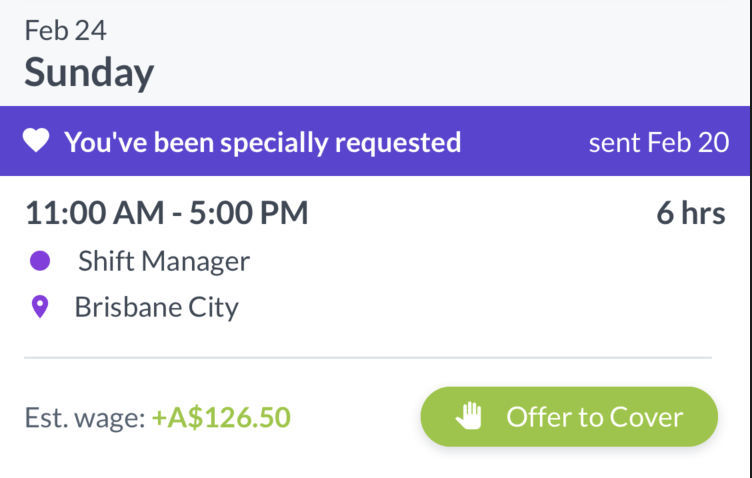 Shift Replacements is a feature we've built to deal with situations where an employee isn't able to work a shift. We've built this feature with manager oversight in mind. By default, shifts can only be covered with manager approval. For more information on what staff members see, take a look at Shift Replacements for Employees. Can a manager put an employee's shift up to be swapped? Staff can tap on a shift in the Tanda mobile app, and then tap the I can't work this shift button. We require the employee to give a reason for their request, to give the manager as much context as possible. For more information on what staff members see, take a look at Shift Replacements for Employees. By default, Shift Replacements requires managers to approve cover requests. This can be done in the Mobile App or on My Tanda. Once a replacement has been requested by an employee, the manager can go into the Shift Replacements on the Overview tab. The number of replacements that need action is shown as a red bubble. You can then choose to offer these shifts to all available people on that team, or offer the shift to specific people on that team if you have a good replacement in mind. You can also decline the request at any time. If you offer to all available people, you can then come back later and select a replacement. Overtime, hours, and other information is shown to managers so that they don't get any nasty surprises in payroll! If a cover request is created less than three days before the shift starts, it is automatically sent to all available staff. This is so that staff can start offering to cover this shift ASAP so that you can have the most amount of time to find a cover for the shift in urgent situations. Managers can still decline this request at any time. Is there any difference between Shift Replacements on the Mobile App and on My Tanda (desktop)? Good Fits do not show in My Tanda — but swaps are still ordered by cost. Roster Validation errors do not show in My Tanda. You can not start a Shift Replacement from My Tanda. We are adding Roster Validation and Good Fits in the near future. Some managers don't have time to deal with shift replacements and prefer a hands-off approach. For these managers, you can turn off Manager Approval in the Rosters tab of your Organisation Settings. 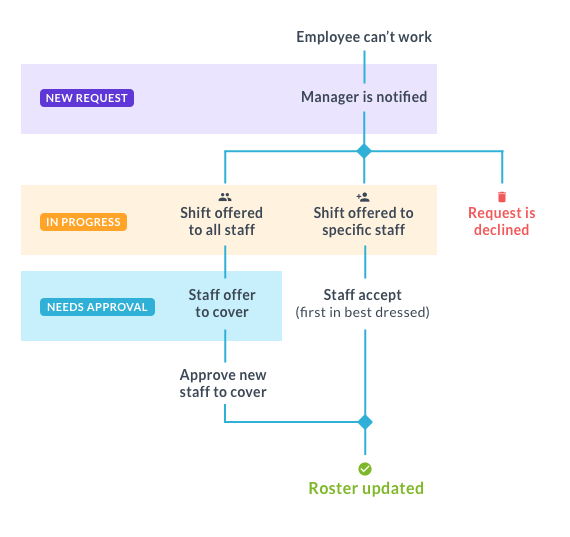 When manager approval is disabled, shifts are automatically offered to all available team members, and the shift will be assigned to the first person to claim it. Manager Approval is required by default. To disable this feature, go to the Rosters tab of your Organisation Settings and uncheck Enable Shift Replacements. Note that Shift Replacements is enabled by default. 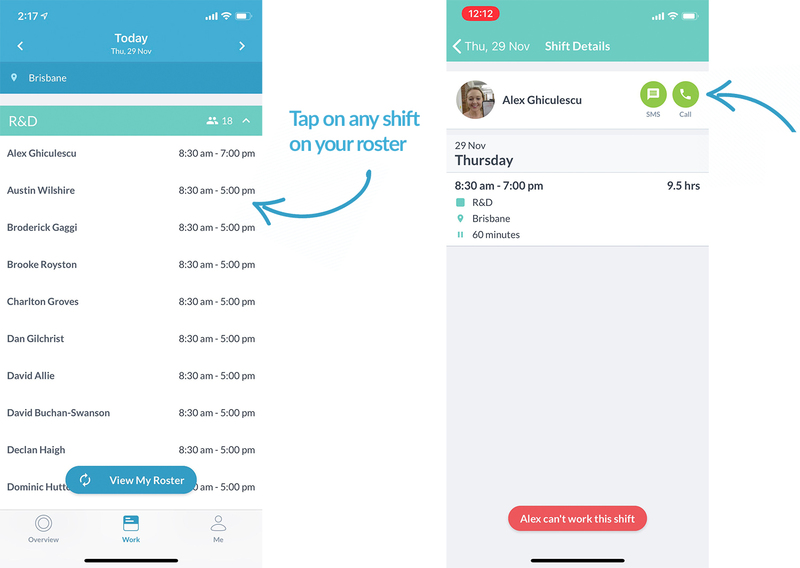 If someone calls you to let you know they can’t come in, you can now tap on their shift in the full roster and broadcast it to available staff, tap the NAME can't work this shift button to bring up your broadcast options. you can also easily get in contact with staff this way too. Can employees swap shifts outside their team? Employees can only swap within teams they have been assigned to. What happens if I offer a shift to a specific person? To receive notifications you need to be a Team Manager in your employee settings, and be assigned to the relevant teams. Check that you haven’t turned notifications off for the Tanda App. Will the feature be available on My Tanda (desktop)? Yes, you can do this at my.tanda.co/rosters/shift_replacements. Can employees find their own replacement? No, our feature has not been designed for employees to find their own replacement. This is deliberate to provide managers more control and oversight over costs. Can employees trade shifts with each other? No. Our cover request system is designed to minimise the amount of requests and roster changes. Shift ‘trades’ can be done manually by editing the roster. What if I don’t want my staff to access this feature? You can turn the feature off in General settings if you’d prefer to manually manage swaps between your staff. Is there a diagram to explain the workflow?